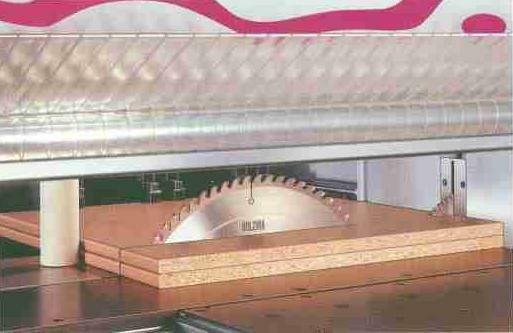 In conjunction with the main saw blade this sawing aggregat is used for the hogging or the "scoring" of the sensitive coating of a particle or fibreboard or cutting and therefore pre-scoring the cutting edges of the main saw blade. 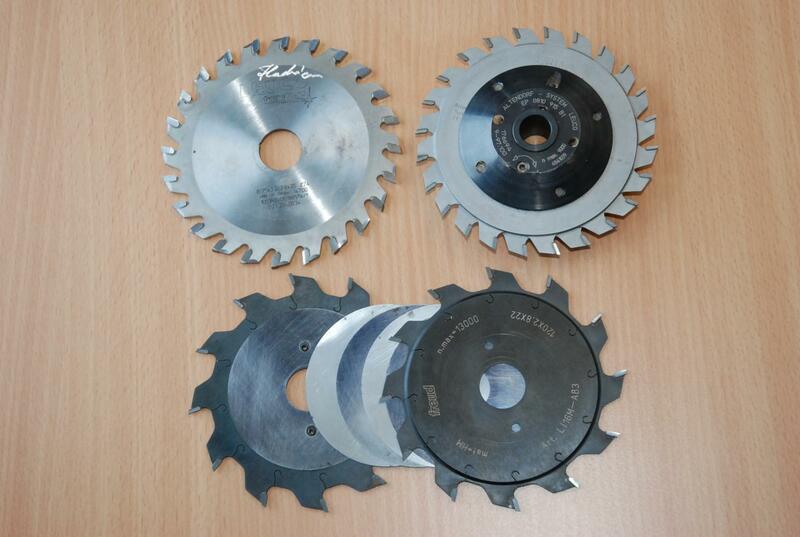 Through the use of scoring aggregates (short: scorer) splinterfree cutting edges are achieved also with hard and frangible surface coating, because the cutting force of the main saw blade are not (any longer) directed against the sensitive cutting edges. 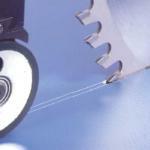 The scoring saw blade is approximately 0.1 mm up to maximum 0.2 mm wider then the main saw blade. 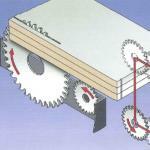 Scoring aggregates work in a clockwise circle (down-cut) and with a higher speed than aggregates of the main saw. 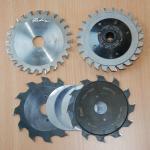 Utilized are divided scoring saw blades (consisting of two parts, which are ajusted through fine thread or with intermediate rings) or conical scoring saws (cutting width is adjustable through the depth of the cut). 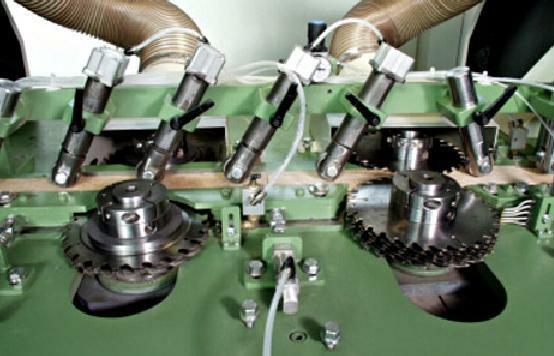 The scoring aggregate leaves a footprint of 1.5 to 2 mm deep grooth in the workpiece.Precisely in this groove just the main aggregate work and proceed the dividing of the workpiece. 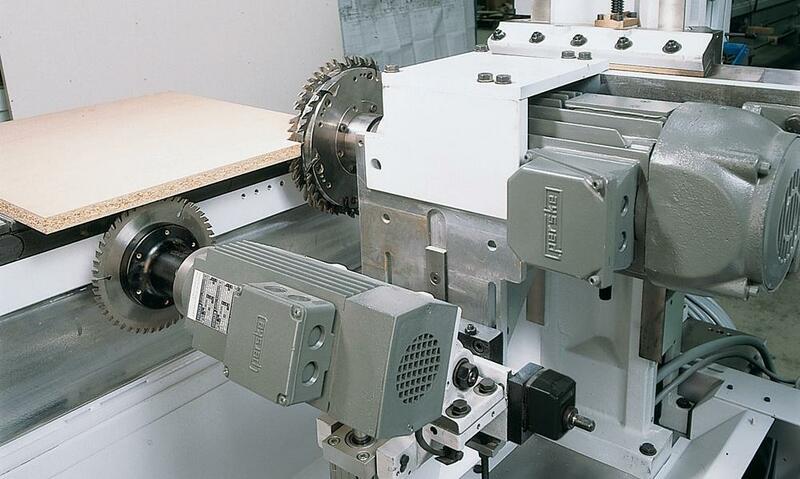 This version is found in many panel saws and in all beamsaws. 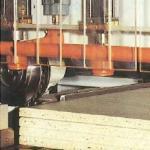 The scoring process is applied to several straight coated panels which lie on top of sheets of panels which lie on top of each other (pack of panels). 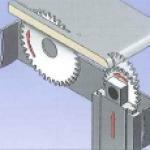 Many manufacturers offer this aggregat as an option and it finds use where panels which are already coated in the zone of the edges need to be divided. 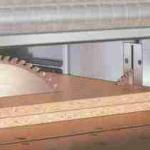 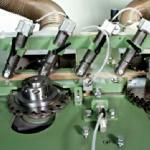 For the scoring of soft - and postforming edges scoring blade appropriate for postformings are used. 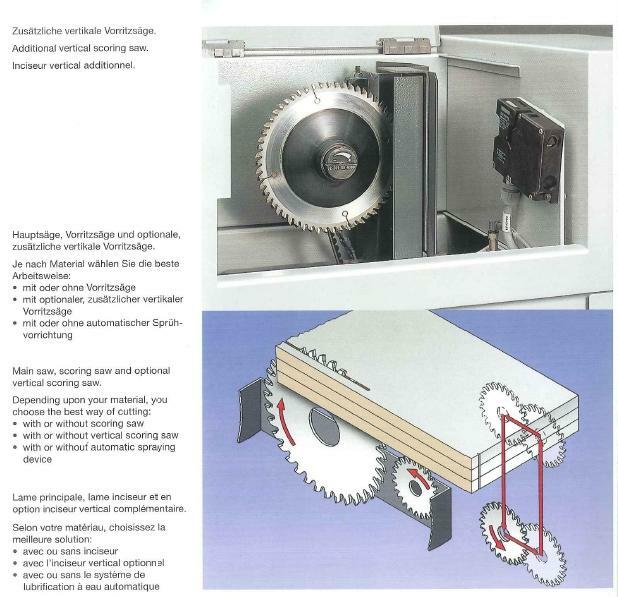 These are sawing aggregates, which automatically spring up in the edge shown of the workpiece and which divide the workpiece entirely.